While visiting Louisville, I had the chance to visit a food truck gathering. And I struck out. Big time. I couldn’t find a single thing gluten-free. The dessert truck was definitely out. The BBQ truck used gluten-full soy sauce in their BBQ sauce. One truck had veggie nachos, but I had to leave the cheese off because they were using a canned cheese sauce that contained gluten. I had chips with veggies on them. And then a kind stranger told me I had to find Sweet ‘n Savory, a gluten-free crepe truck. No way! A gluten-free food truck? In Kentucky? Nuh-uh. Couldn’t believe it. But guess what? It’s true. 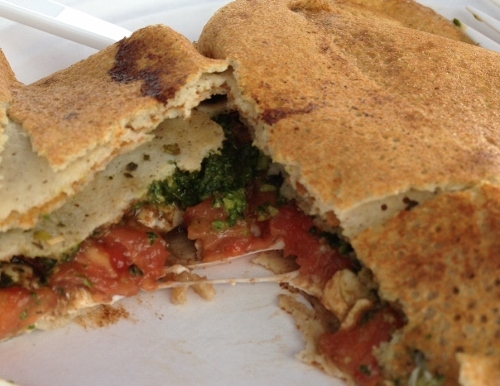 And it’s not just a regular crepe truck that has a gluten-free option, it’s ALL gluten-free crepes. 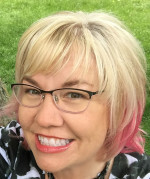 So I checked on-line to see where I could find the Sweet ‘n Savory folks. They were at a farmer’s market just a couple miles from the swell AirBnB accommodations we had in Louisville! Even a threatening sky, which later turned into a big ol’ rainstorm, couldn’t stop me from a good crepe. I’ve had a few gluten-free crepes. I’ve made even more. My fella is a crepe fiend, so they are often on the menu at home. If we lived in Louisville, I would gladly retire my crepe-making skills and just follow the Sweet ‘n Savory folks around. The crepes are divine. We tried two, a banana Nutella and a Caprese. 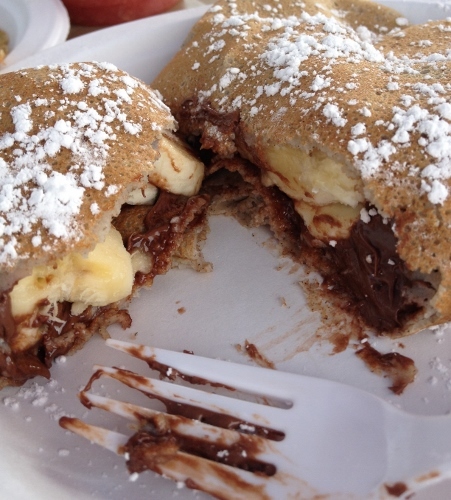 We’ve both eaten banana Nutella crepes anywhere we could find them, from street food in Paris to Louisville. This one was close to the sweet memories I have of the perfect crepes made in Europe. Plenty of Nutella, a nice dusting of powdered sugar and a gluten-free crepe. Perfect! While I would have been thrilled with just the Nutella crepe, the Caprese crepe was a tasty surprise. I prefer sweet crepes to savory crepes, but definitely wanted to try both. The garlic basil pesto in the Caprese crepe was unreal. I know the folks from Sweet ‘n Savory focus on fresh, local ingredients (including some obtained at the very farmers market where we caught up with them) but, dang! The pesto was ahhh-mazing. In addition to crepes, Sweet ‘n Savory also has smoothies and gelato. We didn’t try the gelato. I did have a cucumber watermelon smoothie and it was very good. Cool and refreshing, just fruit and veggie the way it should be. It was brain-freeze inducing and worth it. It was great talking to Ricky and Ashley, the owners of Sweet ‘n Savory. They obviously get what it takes to offer gluten-free food and are committed to creating delicious food. I’m used to feeling like I ask a lot of questions about food and how it is prepared, but with Ricky and Ashley it’s a conversation about food which just happens to be gluten-free. Just nice folks cooking up restaurant-worthy food in their mobile food truck. Go visit these folks and have the best darned crepe you’ve had in the states. 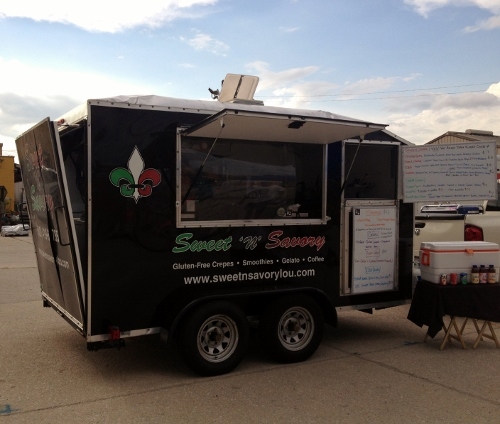 Sweet ‘n Savory is a mobile food truck in Louisville, Kentucky. 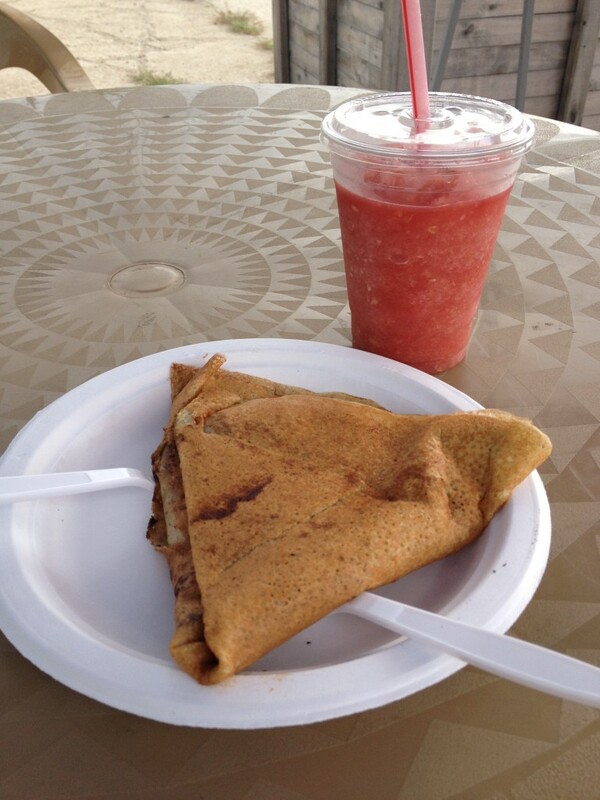 Visit them on Facebook or Twitter to find out where they are selling delicious crepes! Eat With: Minimal Caution. Sweet ‘n Savory is gluten-free, so dining here is easy. Please advise of your dietary restrictions and severity. Ask questions, as always. I think we need to eat here together!